The year-end service also marked the conclusion of Rev. Toshiuki Umitani's assignment as Kailua's interim minister. Mahalo Rev. Umitani and family for being a part of our temple in 2017! In his year-end Dharma message, Rev. Umitani asked us to express gratitude for the past year and reflect on the interdependency on all life and all the things that have made it possible for one to live through the year. The saying, ichinichi senkin (一日千金), "every day is worth a thousand pieces of gold," reminds us that each and every day holds great meaning for our lives and we must live it wisely and meaningfully. 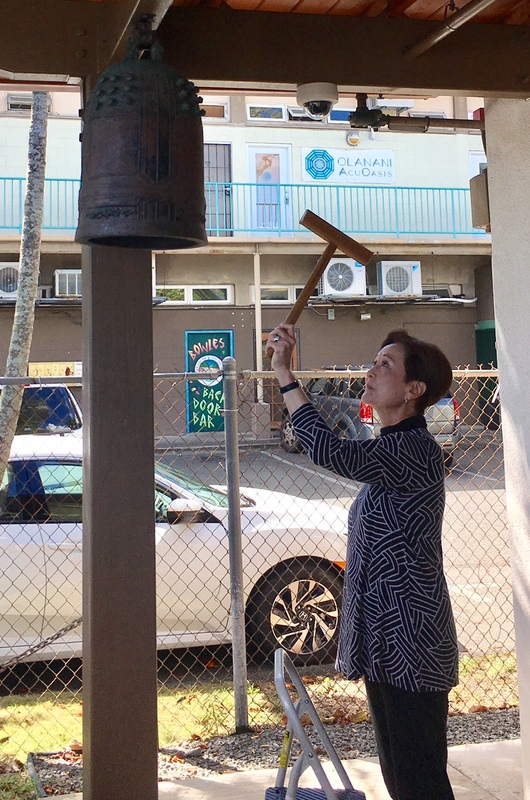 After the service, we rang the kansho (temple bell) to celebrate the end of the year. Jyo-ya no Kane (除夜の鐘) is the Japanese tradition of ringing the temple bell 108 times on New Year's Eve. Watch the video and see if we came close (we weren't counting!). After ringing the bell, we enjoyed soba noodles, also a year-end tradition. The year-end service also marked the conclusion of Rev. Umitani's assignment as Kailua's interim minister. Mahalo Rev. Umitani and family for being a part of our temple in 2017! For today's Dharma message, Rev. Umitani asked everyone to pause for a moment during the busy holiday season and think of the gift of life we've received, each day, each morning, and each moment. The holidays are a time for families and friends to share stories, smiles, and laughter and it is important to feel this sense of togetherness and oneness. Are you living S.M.A.R.T. or with G.A.S.? That was the question Rev. Umitani asked us during today's service. The younger members pitched in to help to clean the temple after we enjoyed refreshments. Today's service was about giving thanks. The Eitaikyo service gives thanks to those who have handed down the Nembutsu teachings and have protected the temple through multiple generations. Rev. Umitani spoke of his home temple growing up in Japan, where services were held every morning, 365 days a year. Today's service was about Ohigan (Autumn Equinox) and Peace. Rev. Umitani said Ohigan is when we should set aside time during our busy schedule to listen to the Buddha's Teachings for guidance. September 21 was a day people all over the world celebrated International Day of Peace (aka "Peace Day"). Rev. Umitani said we should understand the importance of peace and that peace comes from within. At the end of the service, the Sangha individually rang the temple bell ("Kansho") to announce our want for world peace. Today was our final Sunday service for the month of July, as well as the last service before our "summer vacation." Rev. 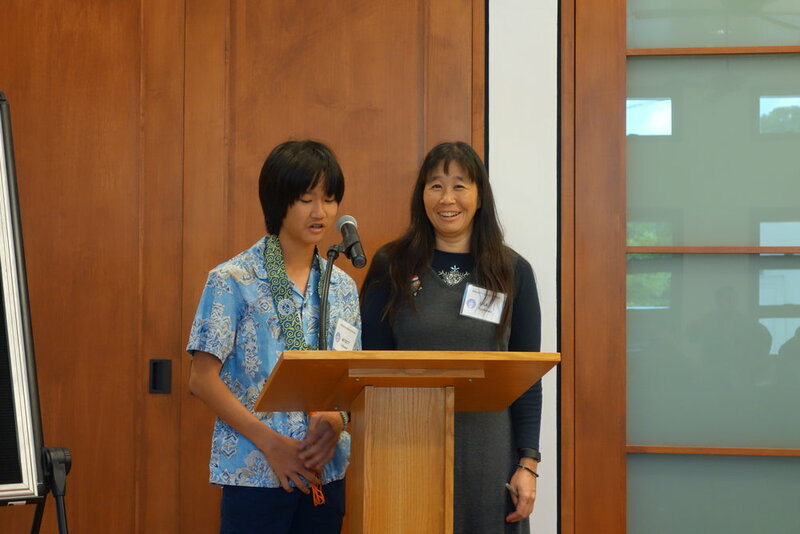 Umitani gave the Dharma Talk, recounting his recent experience at the Accession ceremony and explaining the meaning of Kailua Hongwanji's newsletter, Kalyana Mitra, or "Good Friend." Prudence gave us a preview of the next First Sunday craft activities. We will be making peace bracelets and coloring peace dolls. There will be no Sunday services through the month of August. Our next service will be our First Sunday Family Service on September 3, 2017. In addition to the First Sunday activities, it will also be our Rededication Service. See you then! We held our Hatsubon Service today, remembering those who passed before us and those in particular who passed since last year's obon. Families of those who passed in the last year were called individually to offer incense. Rev. Umitani gave the Dharma Talk, focusing on the hatsu ("first") portion. The left side of the kanji character for hatsu represents clothes and the right side is a sword. To make clothes, one must first cut the cloth. Rev. Toshiyuki Umitani has been assigned to serve Kailua Hongwanji Mission (KHM) as an interim minister while Rev. David Nakamoto is on leave. Rev. Umitani is not a stranger to KHM as he served as our resident minister from January 2004 to February 2005. He and his wife Yoshiko lived in our parsonage down the lane next to the temple. Rev. Umitani is from Hiroshima, Japan. 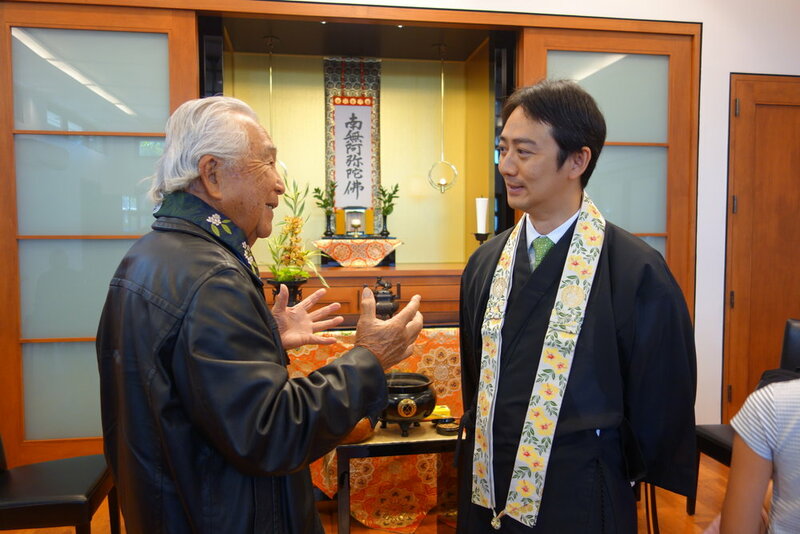 He has an extensive education background which includes Kyoto University of Foreign Studies, Central Institute of Buddhism, the Hongwanji Institute of Liturgy and Musahino University. While in Japan, he received his Tokudo Ordination in 1998 followed by a Kyoshi Certification in 2000. Rev. Umitani arrived in Hawaii in 2001 and began his ministerial duties at the Honpa Hongwanji Betsuin before his KHM assignment. Makawao Hongwanji Mission was his next resident minister assignment. The Umitanis relocated back to Oahu in 2011 when Reverend received his current position of Executive Assistant to the Bishop. He also serves as the Chaplain at the Pacific Buddhist Academy. On the personal side, Rev. Umitani and Yoshiko have two daughters; Naho (12) and Riho (9). He has a PADI (Professional Assn. of Diving Instructors) Master Scuba Diver License and enjoys taking pictures, watching movies and playing with children. As noted on our temple calendar, Rev. Umitani will be our speaker twice in the month of April. We encourage everyone to come to temple to meet him! Welcome back sensei! For ministerial services, please contact Rev. 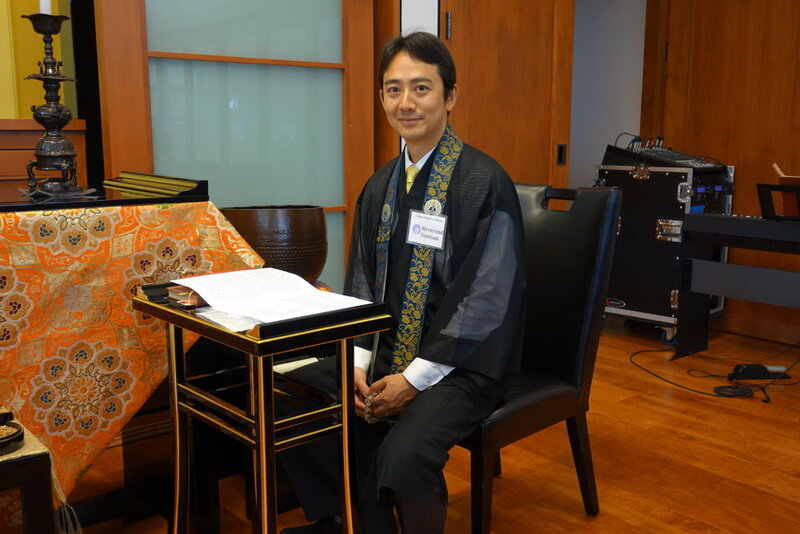 Umitani at 227-1653 and for all other temple matters continue to contact temple president Dennis Tashiro (226-0339). We welcomed Rev. Toshiyuki Umitani, who will be assisting Kailua Hongwanji during Rev. Nakamoto's leave of absence. Currently the Executive Assistant to the Bishop at Honpa Hongwanji Mission of Hawaii, Rev. Umitani is no stranger to Kailua Hongwanji. Kailua was his first resident ministry assignment from 2004 to 2005. Linda Jaffe made her M.C. 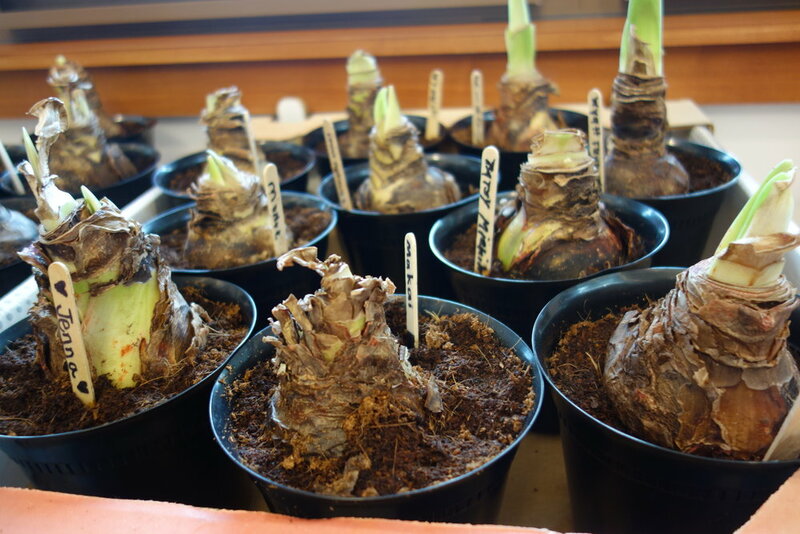 debut and did a great job! Prudence Kusano gave today's Dharma Talk about metta, loving and kindness. Prudence also gave us a preview of next week's First Sunday family activity. We will be making Buddha Day cards. Join us on Sunday, April 2nd at 9:00am for our Family Service.